Learn more about some of the best dirt bike grips, and discover why the ProTaper Pillow Grip took home our Editor’s Choice. I can’t think of another piece of gear more overlooked than dirt bike grips. They are our hand’s first line of connection and feedback from the bike. With the right pair, you shouldn’t even think about them when riding. 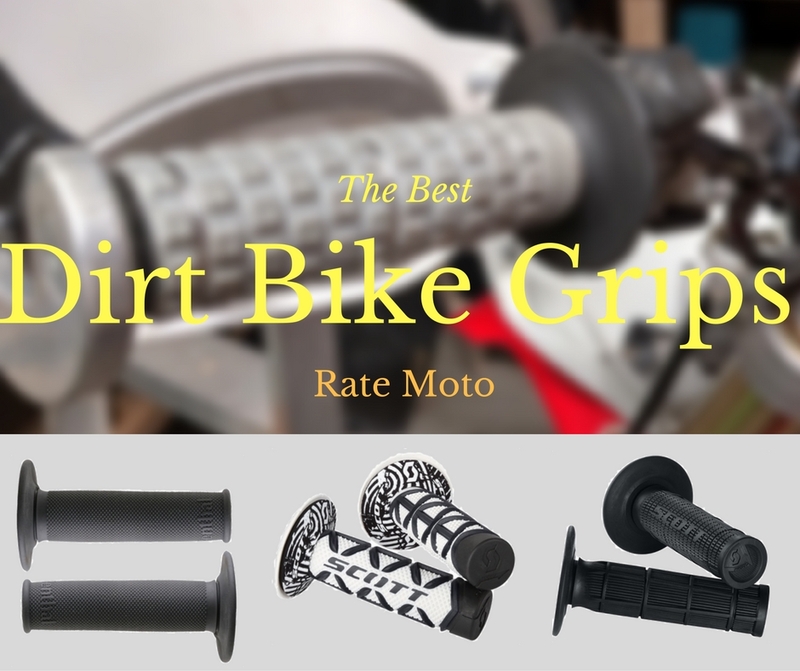 So what are the best dirt bike grips? Continue to find out. Comfort: Obvious right? If your dirt bike grips are strait up uncomfortable after short or long rides then you are running the wrong set. This is heavily based on personal preference but your type of riding and terrain can heavily dictate how soft or firm your grips should be. Durability: This is an issue that plagues low-end or no-name grips regardless of how soft or firm they are. A set of grips is worthless if after a hard weekend of riding they are already ripping and wearing through. Name brand grips are affordable as it is, don’t skimp to save another 3 or 4 bucks. Value: This kind of encompasses the other two things to look for when buying the best grips for a dirt bike. Typically grips with a softer compound will wear quicker. Usually a firmer grip will last longer. This is all relative to your perception of value in dirt bike grips though. For me personally I’d way rather replace grips a couple times a season in exchange of having a softer compound. The ProTaper Pillow Top Grip has been a long time favorite of mine. This boils down to personal preference but I prefer a softer grip, and the Pillow Top definitely qualifies for that. 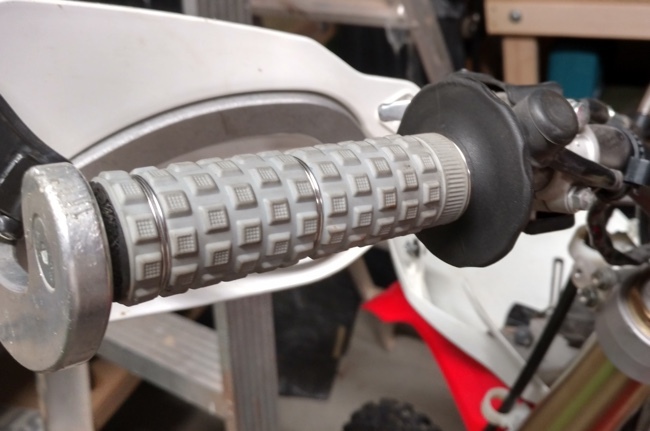 So what makes the ProTaper Pillow Top the best dirt bike grips you can buy? First, I’ve noticed the miniature “pillows” help create a buffer zone between you and the bars. This zone is nothing extreme and will not give you a feeling of disconnect from the bars but more of just separates the rider from some additional unwanted feedback through the bars. I’ve also noticed that I’m less likely to get blisters from hot zones with these grips. I attribute that to those awesome mini pillows. I typically ride off-road almost exclusively. Because of this I run Highway Dirtbikes handguards which connect at the end of my bars. The ProTaper Pillow Top grip has a “cap” of sorts that is molded as once piece with the grips. This cap does a great job of keeping dirt and mud out of the end of your grips when not running handguards. In the event that you need to connect handguards to the end of your bars, ProTaper was smart enough to basically design this end cap as a cutting edge for your box cutter so they can easily be cut off and fitted. This sounds like a non issue but after installing and manipulating multiple grips for your situation you begin to appreciate the subtle differences. Now were getting back to our roots! 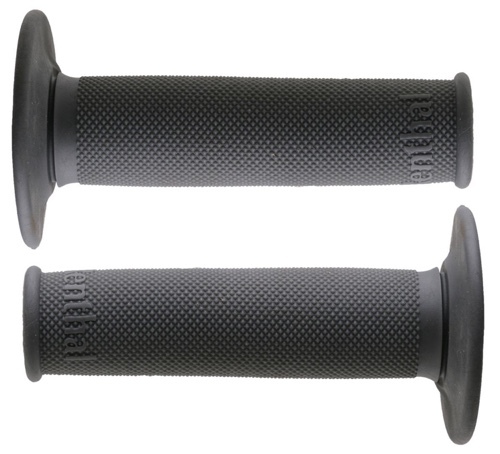 The Scott Sports Radial Grips will take you back to the 90’s…in a good way. These grips feature the half waffle design that was popular for so many years and preferred by many to this day. The idea behind the half waffle design was to give your fingers something additional to grip onto while allowing your palms to rest on a smooth surface. Many racers still prefer this design but personally, my favorite feature of this grip is the integrated safety wire channels. I always safety wire my grips and any feature in a grip that makes this easily to accomplish deserves recognition in my book. The Scott Sports Radial is a labeled as a soft but most would probably consider it closer to a medium compound. It also is not gel based as I know that is something some consider as a negative. 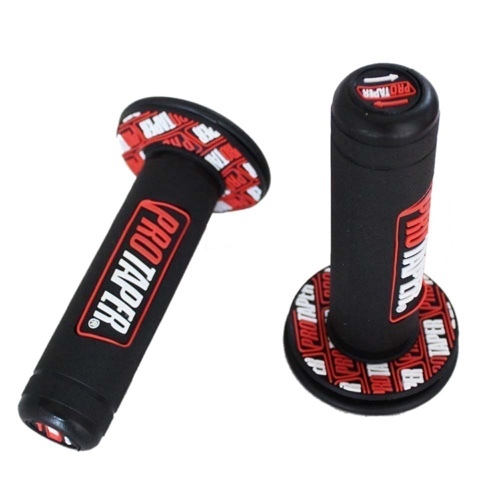 The ProTaper Dual Density Gel Grip may not be long for this world so buy them while you can! 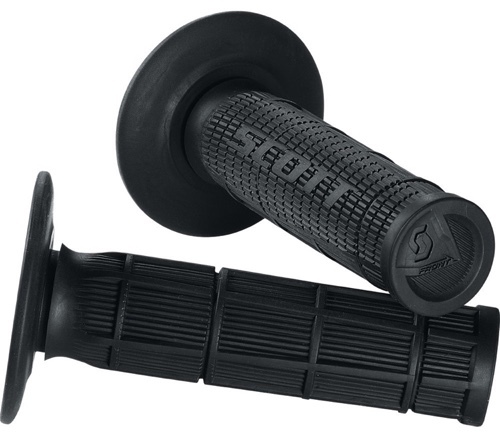 This dual density grip tries to combine the benefits of a longer lasting firm grip with the tackiness of a soft grip. This grip is extremely popular with top level racers because of its extremely tacky feel. That extreme tacky feeling doesn’t come at no cost however. Typically gel based grips can leave a sticky residue after hard use. Is this really a big deal? To most no but to some it can become quite bothersome. In my experience the ProTaper Dual Density is great grip if you are looking for one of the tackier grips you can buy. Do be aware that it may wear slightly faster than other grips however. 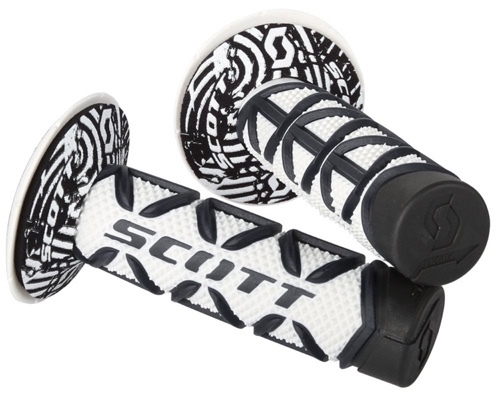 The Scott Sports Diamond Grip is a new age grip of sorts derived from the classic waffle grip. The criss-crossed diamond pattern consists of a very soft rubber while the base material is quite firm. The design of this grip will be polarizing and is fairly “loud” but you only see that when your bike is not being ridden! So should be a non-issue right? This grip should be very durable and last at least a season of hard riding. Also just to note, safety wiring can be a bit awkward as there are no safety wire channels or natural groves for it to go into. Another classic grip, the Renthal Full Diamond. Last but not least, the Renthal Full Diamond was probably my most used grip up until switching to the ProTaper Pillow Top. This is does not mean that the Renthal is an inferior grip by any means, it just means I found a slightly better grip for my needs. Perhaps the strongest suit for the Renthal Full Diamond is it comes in 3 compound densities. With choosing between firm, medium and soft this grip can pretty much be matched to any riding style or preference. As an added bonus, these grips are exceptionally easy to safety wire and have end caps that give a nice ridge to cut against if running hand guards.